Do you best to stick to your healthy eating plans, but don’t start a new one. During the holiday season, there is usually an abundance of good food and the temptation to eat is huge; but the best strategy is to serve yourself small portions of the calorie-laden potatoes, ham, rolls and pecan pie. 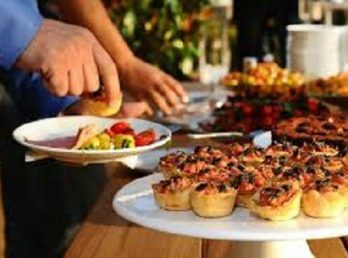 If you tend to overindulge at an office party, you can still keep your commitment to a healthy diet by having a lighter meal the following day. Eat regularly- the moment you skip meals you will end up overeating holiday food. The best way to start the day is to eat a healthy breakfast so you are not tempted to overeat. Eat a few snacks rather than three large meals. People who eat small snacks every few hours can help curb the hunger pangs and prevent over eating. If you feel like you can’t help yourself from binge eating of holiday food, fill half the plate with vegetables and fruits FIRST and scale back a little on the turkey, beef and pork portions. During the holiday season, there are LOTS of high calorie foods like chocolates, cakes and other desserts- best advice–take a bite and move on. One easy way to add calories is drinking both alcoholic and non-alcoholic drinks. If you do decide to drink, choose low calorie drinks such as fruit juices with water added to reduce sugar and caloric content, sparkling water with lime or club soda. Despite all of the tips given here, you may be in the category of the majority of people who will tend to overeat during the holiday season. However, by remaining active, you can burn the extra calories you ingested. Aim to exercise every day for 30-45 minutes and keep in mind you do not have to join the gym or perform any type of exercise with heavy equipment. Walking is the easiest form of exercise since it is free, you can enjoy the beautiful scenery and it is safe unless you text while walking and stumble into a pothole! Walk briskly for 30-45 minutes everyday and you will help prevent your waistline from growing these holidays.